"Obscene" memes posted on a private Facebook page have cost 10 students their place at Harvard, reports the college's newspaper. The students posted messages joking about child abuse, sexual assault, paedophilia and the Holocaust. Members of the group also directed several racial slurs at minorities, said the report. 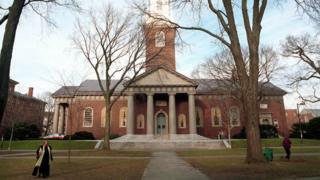 Free speech advocates criticised Harvard's actions saying the punishment was "draconian". Information about Harvard's actions was reported by the Crimson - the main student newspaper at the prestigious college. The obscene material was posted to a chat forum on Facebook that grew out of a messaging group set up by students due to start studying at Harvard this year. The offshoot group was formed by prospective students who were interested in memes and who wanted to share more "adult" material than was seen in the main chat room. Anyone wanting to join the sub-group had to apply by creating and posting a "provocative" meme. Soon after the group was formed, Harvard administrators found out about it and launched an investigation asking students to explain their contributions to the chat group. A week later, said the report, "at least 10" members of the group were told that their admission offers to Harvard had been withdrawn. In a statement to the Crimson, a spokeswoman for Harvard said it did "not comment publicly on the admissions status of individual applicants". Prof Alan Dershowitz, who lectures at the Harvard Law School, said the college had gone too far in withdrawing the offer of admission. He told the Guardian that the institution had been "intruding too deeply" into the private lives of students by censoring communications protected by free speech laws. The decision could have long-term consequences for the students involved, he warned. "It may affect them for life," he said.